It seems each day brings a basketful of decision making chores. Things that one thinks should be so simple seems like a load to heavy to carry when placed in a mind. My brother as he looked near death in the face would so often say to me, “too much information.” I began to label all information, both incoming and outgoing, either TMI (too much information) or NEI (not enough information). Granted, I, hopefully, knew and know the difference between withholding valuable information. Timely information. Wrong information. But, there seems to be a lot of information I’m not sure what to do with and why I even have it. As well as information others withhold and handle so untimely and even giving untruthful and/or distorted information. This information gig has fighting red horns! This brings me to the reason I choose for my meditative thoughts this scripture found in Isaiah, the Lord will comfort me and you just like a loving Mother comforts her child. Let us think about the many times in our lives when God has comforted us with love and grace in moments of hurt and uncertainty. These memories bring us comfort and peace as well as gratitude and humility that God would intervene in our life on this intimate personal level. Each day may bring, TMI or NEI and information may feel like an emotional whip but loving arms are always open to hug away our tears. My summary on why I think dealing with information to be so difficult; “lack of love.” What info do you have to offer? This is my take on the I in C [information in conflict] I agree that conflicting information is a time waster & befuddling of minds that are already on overload.. The ‘mis’information out there is another of my pet peeves. “X” is good for you. “X” is bad for you. Don’t drink “Y” as it is not conducive to good health. Drink more”Y” as it helps with such & such. You are not drinking enough water. Too much water can kill you. YIKES! Then the point that you made, Sara, when people tell you [I’;m using the inclusive you] their troubles or report a scenario that they’ve experienced or are in the midst of…..and you listen, gathering the facts hoping to find a break where you can either commiserate with them or pray for them But that’s NOT what they want from you. So you are left with a load of half-truths, someone’s family battles, etc. This is a load on your mind, now…… Information about which we can do nothing. [except pray, of course]. But they don’t want prayer or counsel. I believe that’s when we fall into THE EVERLASTING ARMS. Father, I don’t know what to do about this situation that someone has foisted upon me about which I do not understand. Oh and Sara, I could counter your statement that the problem is lack of love. NO! There’s plenty of love all right, but it is self-love. Me, Myself & I. Ego, Id & narcissism. Some of my thoughts on the telling of troubles, etc. I would say that might just be the most difficult of information because hurts, wounds, addictions, emotions, offenses, physical and other co/mingled pain often distort our views. And, often the listener has some of the same issues that gives rise to panic and ears began to ache, hearts begin to cry and only loving, caring, compassionate arms can basket the pain. We understand with wisdom just how difficult learning issues may often be for children and adults alike. As one ages forms of dementia may became another telling and listening issue. Medication often distort both telling, listening and reacting. Culture understanding as well as personalities of expression seems to color thought and action. We live in a world where information is gathered and garnered by technology hearing, seeing and acting in a flash quicker than my expression of words. The last few years when my brother was sick, dying while clinging to hope information like world political hot issues that he loved and felt such a part of for many years had fallen in the category of TMI. Some days when feeling a little stronger he still wanted and spent hours involved in. But, there were days when those issues like war, poverty, homeless, etc. would become a basketful just to heavy to carry. Isaiah 66:13 would be the only comfort that had the strength to work. At times during sickness I have felt a little like that. In this dialogue I hope to express, listen, respond and find solutions that becomes help tips for daily living. And especially those of us that believe we know how to stimulate answers for ourselves and others from our prayers. I learned much from interacting with my brother. Each of us have a story. I find information when handled by a Mother or God carrys the same comfort. That’s power for the hurting! I laughed a little when I read this because I started to agree with that thought. And yet, aside from God,sometimes some mothers, comfort or no, may be part of the problem. When Isaiah wrote that, of course inspired by the Holy Spirit it might have a hit more truth to it than the times we are living in now. But the point is well taken. And even GOD has a different point of view than we do or even than ‘MOM’ does. Withholding information in a tale to balance the scale in our direction seems like a cruel joke…making a fool of oneself and of the hearer especially one who is keen on being a helper in the situation. But when the information is withheld to the advantage of the speaker, it brings incalculable harm to the situation and to the relationship. Why tell it at all, then? Trying to involve another in one’s scheme of deception to prove a point is a sin. It is called manipulation and elicitation….eliciting one’s sympathies under false pretenses. That is mean!! I see the truth of what your brother was saying who always saw things clearly…a gift of God, no doubt….. and I also believe that TMI with which one can do nothing about is overload, for sure. And, NEI or withholding info can be criminal in intent. There is always counterfeit in all things that seem to creep in the mind like a Haloween spider fine tuning a web that is naturally fine tuned. When Isaiah was speaking truth he had a picturesque scene in a healthy mind, no webs. A Shepherd so attuned to the sheep they shall not want and a Mother so connected to a child that protective armor sets in when trouble abodes. I think God purposely wants His Children to frame their minds to the perfection that only He, Our Father, can give. Imagine for a brief moment not being God’s child in contrast to being His child. There are host upon host of different uniforms fighting for our attention. As children of God we keep our eyes lifted up unto the hills from which our help comes. If you wear the opposing uniform you might find yourself looking within where windows of Hope have diminished or fogged beyond pastures and loving strong arms recognition. Interesting points MG on the cruel jokes and fools. Wrong color uniforms to say the least. God has something to say about those jokesters and I refuse to play the game. “There are host upon host of different uniforms fighting for our attention”…. Hum, all the more reason I need to practice Psalm 46:10. Heavenly Father, I ask You to help me “frame my mind on the perfection that only You can give.” In Jesus name amen. Tammy, humor and joy are a part of framing our minds on God given perfection. 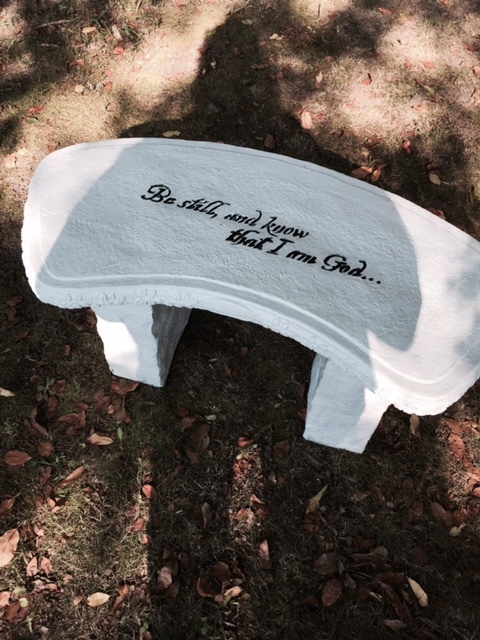 When I read your practice exercises found in Psalms 46:10 I knew you had paused and sat for awhile on our meditative bench shown above. I had the little song prompt me to sing, “And, if the devil dosent like it he can sit on a tack!” YAY! We sit on Psalms 46:10 and relax and enjoy the beauty of life and if the devil dosent like he can sit on painful holding misery, self pity losing tactics. And, he is stuck with a tack. We sit on the bench promise and God’s power confronts the conflict. I just realized some of the meaning of this song! Sara…I love it….. in reference to what you wrote above…..we sit on the meditative bench of Revelation of the Word of God’s comfort where upon lies the cushion of the Everlasting arms and satan sits on the ‘pointed tack of revelation’ that his end is near, so very near. I see framing the mind here like framing a house, building its structure. So a healthy mind would need a healthy framework or structure…and building a structure is work and often difficult in some of life’s stormy times and rainy seasons, etc. My mind experience has often been a battleground due to many poor choices I have made in the past. And from this experience I can relate to Sara’s statement. ” “…If you wear the opposing uniform you might find yourself looking within…” And looking within means I lose capacity to look out…to the harvest field…to others needs. This from Sara, “… I choose for my meditative thoughts this scripture…” says to me that there is great hope to freedom and health in making right choices and choosing what enters the mind gateway. Often when I feel weak and faltering and wobbly in my mental framework, I have found solid footing, direction and help in reading The Daily Lily and Sara’s words on these blogs and often hearing a personal word or receiving a personal timely writing from her. It is real mind food for which I am so appreciative of its value. Sometimes the reading/hearing requires an exercise of action…and that too, though sometimes difficult, is strengthening the framework. These are just some reflections I wanted to share as I read and re-read these posts. Another, see your Dr. and take your anti-depressant pills. Now, both are helpful and needful. But one goes inward and one goes outward and both for mental health. And, yet, another, read the word, pray, and act on the word in tandem with others. Have you ever tried to connect with another and regardless if they or you bring up a thought, spoken or written, to develop and you begin the process by taking the thought seeing the picture add to like laying out and working a puzzle thru and within seconds they are marching on like a hurricane hit their minds and they don’t even remember the goal that the first thought set. I call that information in conflict. As Christians I believe spiritual gifts connect to the Head, being Jesus Christ, Himself. * This brings me to my thought, if the mind is pilfering for info to just be seen or heard, we must have ditched our role and tried to siege and saratoga the man we most likely were quoting.